At age twenty-eight, Chick Corea had already made serious contributions on studio dates with Herbie Mann, Hubert Laws, Cal Tjader, Dave Pike, Donald Byrd, and Stan Getz often contributing arrangements as well as playing piano. He had also recorded his first solo album in 1966, Tones for Joan’s Bones, with Woody Shaw on trumpet, which was released in April 1968. Corea started playing piano at age four, developing not only impressive piano skills, but a passionate love for both classical and jazz music. This mastery of the two genres is apparent in this album, the format of jazz trio working well in terms of emphasizing the piano part and facilitating optimal engagement between a small set of artists. “Steps – What Was” starts with piano solo soon joined by veteran Roy Haynes on drums and twenty-year old Czech classically-trained Miroslav Vitouš on acoustic bass. The work brims with enthusiasm and freshness and, after a brief drum solo by Haynes and before a bass solo by Vitouš, is a wonderful piano-led passage that reveals an early version of Corea’s “Spain” theme. “Matrix’ includes a brief statement of the theme and a wild ride of head-spinning improvisation, again including room for statements by Vitouš and Haynes. The next two tracks take their title from the explanation of the third line of the Kung Fú (Inmost Sincerity) hexagram in the ancient Chinese Book of Changes, The I Ching, roughly translated as “Now he beats his drum, and now he leaves off. Now he weeps, and now he sings.” These two works are very different with “Now He Sings, Now He Sobs”, being generally forward-looking, energetic and optimistic and “Now He Beats The Drum, Now He Stops” being more of a two-part composition, with the first section, a piano solo, full of reflection and inner-doubt, and the second section surging with revitalization and purpose. The last track, “The Law Of Falling And Catching Up” is a free-jazz excursion with Corea directly accessing the strings of the grand piano. Somewhat pointillistic and Webern-like, the piece is sweeping in texture and content yet, at under two and half minutes, compact and focused. First and most important: Happy Birthday, John Birks “Dizzy” Gillespie. Born one hundred years ago, on October 21, 1917 and blessing us music lovers with his presence until Jan 6, 1993, leaving a catalog of excellent to must-listen-to music for many generations of listeners. I was lucky enough to see him live in Oslo, Norway in 1978 and hear him and his group play “Night in Tunisia.” He was personable, relaxed, and loved being in front of a small auditorium of very attentive listeners. The music was excellent and the time raced by. At the end, I realized how lucky I was to get a ticket that very evening an hour or two before the performance, and thus be able to witness such amazing music. I am also thankful that I had a friend, who earlier, in California, had persuaded me to go with him to listen to jazz artists like Sonny Stitt and Milt Jackson, leading my onto the path of developing my love for bebop. You see, Dizzy was one of the founding fathers of bebop, along with other giants like Charlie Parker, Thelonious Monk, and Bud Powell. The recordings he made in the 1940s with Charlie Parker are essential listening, and are as an important part of musical history as the premiere of Stravinsky’s “Rite of Spring” (aka “Le Sacre du printemps”), Alban Berg’s two amazing operas, or the British Invasion and the rise of The Beatles and development of progressive rock. We are very fortunate that on October 1st, 1967, three sets of music were recorded at the Village Vanguard, the famous jazz New York City jazz club. The Solid State LP includes three tracks, one from each set, with Dizzy, Pepper Adams on baritone saxophone, Ray Nance on violin, Chick Corea on piano, Richard Davis on bass, and, on drums, Elvin Jones on “Dizzy’s Blues”, and Mel Lewis on the other two tracks. Later, Solid State releases two more LPs of material, which Blue Note later releases on CD in a 2 CD set. 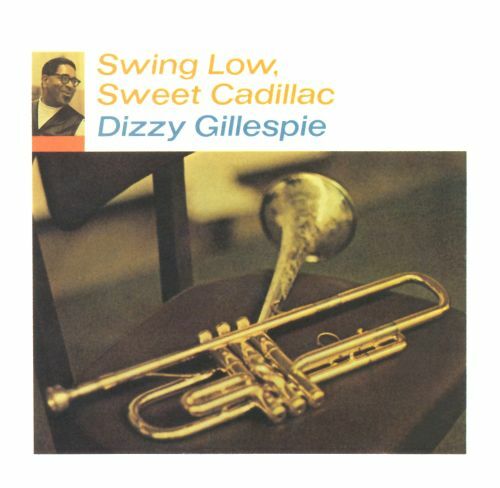 As great as this music is, I would advise to supplement it with another live album, “Sweet Low, Sweet Cadillac.” The Impulse record label brings together recordings from three different concerts in May 1967, one in NYC and two in L.A. to provide another glimpse of what a Dizzy-led 1967 live performance was like. The playfulness and charm of the master is captured as well as some great music. This is the only recording I have where Dizzy sings, and, though not at the level as the 1967 Village Vanguard recordings, this is a treat not to be missed.